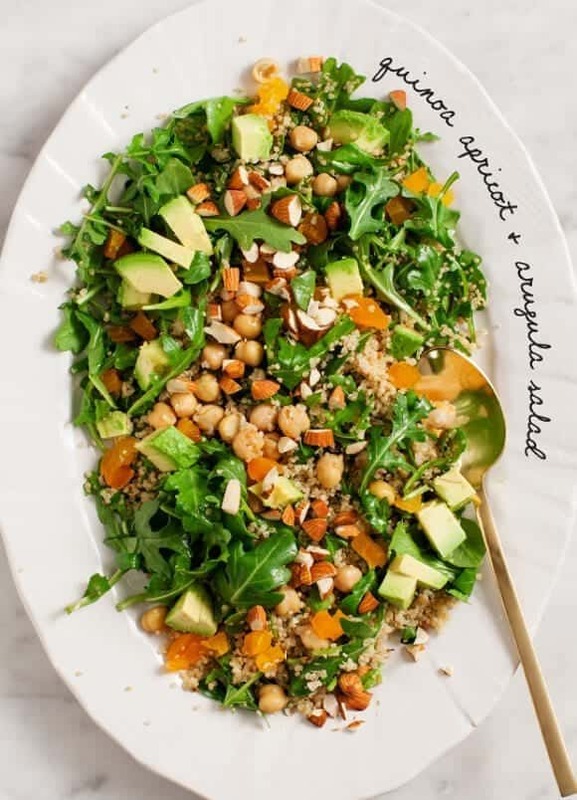 A flavorful arugula salad made with cumin-spiced dressing, tangy dried apricots, avocado, quinoa and chickpeas. 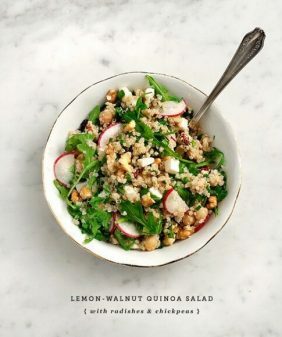 I’ll never get tired of an arugula salad with avocado and quinoa. They’re probably my favorite three ingredients to use. I love this sweet combo of dried apricots, peppery arugula, smoky cumin and fruity Arbequina Olive Oil. (I almost named this Arbequina Quinoa – but try to say that one five times fast). So what’s Arbequina Olive Oil? It’s a light and fruity extra virgin olive oil that’s perfect for flavorful like this one. Coincidentally, I’ve been buying it long before the folks at California Olive Ranch started sending it to me. Try it, I promise you’ll love it. (I usually get mine at Whole Foods). You can also use any quality extra-virgin olive oil in this recipe. If you love salads as much as I do, check out many many more in the salad section of our recipe index! Whisk together the olive oil, garlic, lemon, honey, cumin, chives, red pepper flakes, salt, and pepper. Set aside. In a large bowl, toss together the quinoa, chickpeas, arugula, dried apricots, and a few generous pinches of salt and pepper. Drizzle in ¾ of the dressing and toss again. Top with the avocado, chopped almonds, chives, and drizzle the remaining dressing. Season to taste and serve. 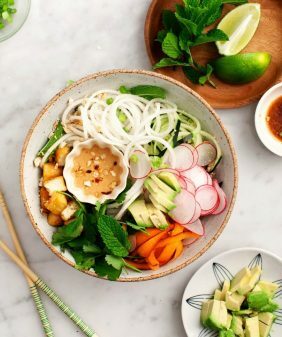 I am just back from a 1-month holiday and this salad looks like the perfect way to get back into healthy eating. Lovely. This salad’s looking great! I can’t wait to try the recipe, it’ll be perfect for a nice, warm summer evening! I will have to give this combo a try – love the pairing of salty and sweet and peppery arugula. The olive oil sounds like a great addition too – I’ll have to check it out!! I’ve been taste-testing different olive oils lately and there’s a huge variety I didn’t know about before. The “Arbequina” olive oil sounds like it would be lovely here. Oh wow! 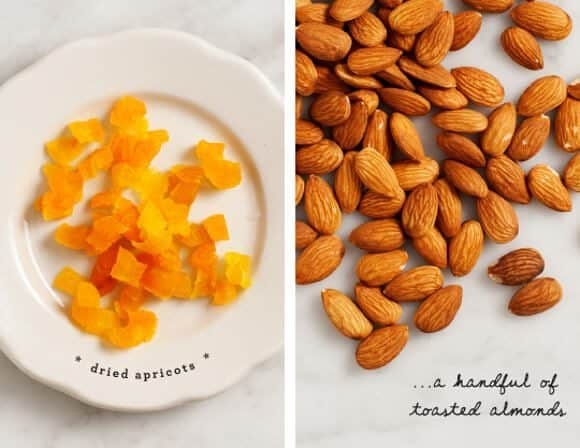 Ive had alot of dried apricots in my pantry that Ive been wanting to put to good use! 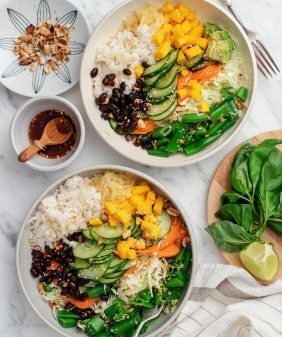 This is a gorgeous looking salad that is completely up my alley! I make a cumin lentil soup with dried apricots, so I know how good the cumin-apricot pairing is. I could eat this kind of quinoa salad every day! Nice one! Could you send me your cumin lentil soup with dried apricots recipe please? Sounds yummy! Thank you. Ohhhh my goodness, this looks delicious. I may have to give this a go. Unfortunately, I’m allergic to apricots. It sounds delicious, even without them… but might you have any ideas for a substitute? Maybe some dried mango or pineapple or something, I don’t know. Hmmm. Dried mango! what a great idea! I live in Costa Rica where dried apricots are the price of gold and mangoes litter the ground. I love the idea of drying them. I also grow arugula all year round.This salad sounds fantastic, will try asap, it’s always summer here! I luuuuuurv CA Olive Ranch oils. Such a robust flavor. 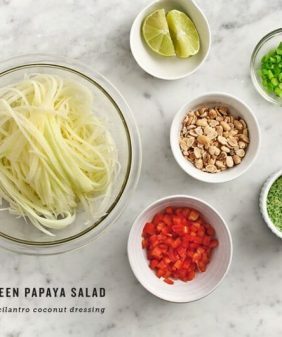 This salad looks like a perfect way to use it! This looks wonderful! What a perfect spring salad. This is a giant bowl of good health! Holy smackeroonie this looks yummy! Girl, this salad looks beautiful! This is such an amazing salad! Love the summery notes of the olive oil and the quinoa! Delicious! I am so looking forward to putting this on my families dinner menu! Looks so good. I haven’t heard of Arbequina but it sounds amazing! I’m making this this week, beautiful! sounds so yummy. is the cumin in the dressing whole or ground? many thanks for your speedy reply – on the menu now for my lunch! This looks delicious! Any suggestions of what I could substitute for cumin in the dressing? (It’s one spice that I’m lacking in my cupboard at the moment) Maybe turmeric? I think turmeric would be great (maybe with a pinch of cayenne for some heat, if you have some ground corriander, that would also be nice with turmeric). OR Paprika would work too (if it’s smoked paprika, start with less, add more to taste). Thanks Jeanine! Can’t wait to try it! Ha, I’m not sure I’ve noticed that problem :). Try tossing the greens with the quinoa while it’s still a little bit warm (not hot) – it’ll wilt them slightly and help everything stay together. 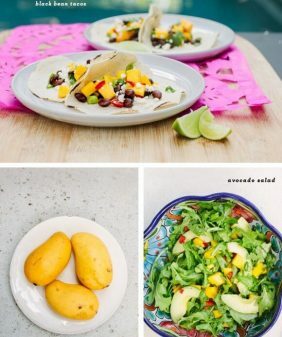 I love a little pop of sweetness in salads! 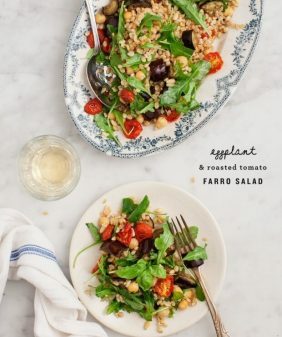 Wow, this sounds like the perfect salad for hot summer days. Can’t wait to try this recipe! We had this delicious salad this evening. Thanks! This was fantastic. I used fresh apricots instead of dried, and added some fresh green onions as I had them handy. Great salad. Thank you! How many servings does this make?? Thank you so much for your quick reply! Can’t wait to make it! I have posted a link to your site on my food blog! Please check it out! Thank you for sharing your beautiful dishes! The tasks are largely PvP driven and objective based gameplay. and offers an opportunity to play MOBA has a lot of losses for them. and rank higher than before. This salad was delicious! I made it with fresh apricots rather than dry since they’re in season. I gota say though-this dressing had way too much garlic for me! one glove or less would do the trick next time. Made this last night along with many other salads…. This one stole the show,, soooooooo good….thanks for the recipe! Nice recipe for quinoa arugula and apricot salad, especially for the summer months. Looks so healthy and delicious. Thanks. This salad sounds absolutely wonderful. However I wish you had used apricots without sulphur dioxide added – you know the brownish ones that are so soft and sweet. I realize the colour is not as appealing as the sulphured ones, which is why they do that, but there are many of us who cannot tolerate sulphur. I would prefer the organic apricots anyway which would not contain this drug which can be life-threatening to some! I’m so glad! It’s one of my favorites – I just love the little bit of warm spice the cumin adds. I’ve made this salad three times so far, but could eat it often. When I’ve been out of one ingredient or another (apricots, chives, arugula avocado), I’ve substituted something else (raisins or cranberries, scallions, mesclun) or gone one without it (avocado) and it’s still been amazingly bright and tasty. 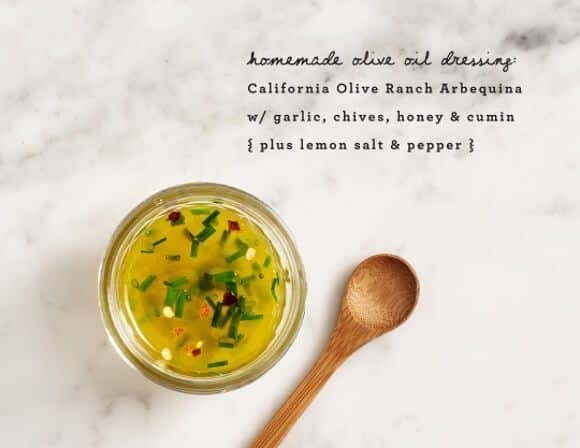 The dressing is delicious and can be used on other salads too. My kids, 20’s and 30-something foodies, love this salad! Thanks for posting the recipe! Made this salad for a picnic – added watermelon radishes for an extra splash of color. I’m vegan so for the dressing I used agave instead of honey. This dressing is fantastic, I’ve also made the dressing on its own with brown rice syrup and also with maple syrup instead of the honey. This dressing has become a staple in my home.